New VDSL2/ADSL2 modem. These have been on the shelf for a while and we no longer use them because our network switched to fiber. These can support data rates of up to 100M down and 50M up. I have a total of 18 of these, 15 used and 3 new. The AR-5381u is also designed with TR-068 compliant color panel, which eases the installation of the modem and makes it more user-friendly. Wi-Fi On/Off, Power, Reset (1x Each) USB host X 1. The AR-5381 complies with TR-069/TR-098/ and TR-111 standards to ensure interoperability with standards-based Software and Hardware. Here is a link to the data sheet. Cash is only accepted for will-calls (in-person). prior to purchasing. Our warranty excludes all consumable goods, eg. Compatibility issues are not considered DOA. Let us earn your loyalty! stands to reason that issues will arise occasionally. Cleaned, Defaulted, Upgraded. Modems have been cleaned, factory defaulted, and upgraded to the latest available firmware. 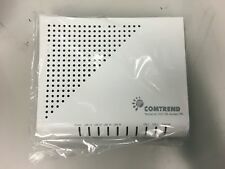 Comtrend NexuLlink 3100u ADSL2/VDSL2 Multi DSL Bonded Windstream Router Modem. Good Condition. I bought this used to stop paying the monthly modem rental fee to Windstream. Everything seems to work but I could not get it set up on my network. I don't have the patience or time to figure out why. No Reserve. These have been set to factory defaults and upgraded to the latest FW. I have a total of 17 of these and will give a price break on quantity orders. • G.992.5 (ADSL2 ). • G.992.3 (ADSL2). 4 Ethernet Ports | USB Host. Cleaned, Defaulted, Upgraded. Modems have been cleaned, factory defaulted, and upgraded to the latest available firmware. RJ-11 X1 for ADSL2 . G.992.5 (ADSL2 ) G.992.3 (ADSL2). Power switch X 1. Support MDI/MDX. Comtrend Multi-DSL Router VR-3030 for sale! Used for approximately 5 months and includes wall plug-in and start-up disc in original packaging and box. The item exteriors may have minor scratches, scuffs, dents, cracks, nicks, etc. Local pickup is available. This item has been successfully tested for power on/key functions and is R2/Ready For Resale. This comtrend is used and works excellent. There is hardly any surface wear. It was used in a computer tech office and we no longer need it. It includes a power cord. Shipping includes a tracking number. So it fits unobtrusively almost anywhere, including hanging from a screw or nail on the side of a desk or a wall. If you want more technical information about it, just look up this model on the internet. Works great, does not come with the power cord. Now its set as = user:admin pass.w:admin. Includes one Comtrend CT-5372 as pictured above. Product Information Manufacturer: Comtrend. 4 Ethernet Port. No other parts or accessories are included. Product Information Manufacturer: Comtrend. IN BOX WITH EVERYTHING YOU NEED TO SET IT UP(SEE PHOTO). Unit is listed As Is/ For Parts/ Non Working due to inability to test the unit.